Winter weather...gardening...working with fiber...mechanics...Just a few reasons why we get dry, cracked, and painful cuticles. My kids are forever getting hangnails or little splits in theirs, and they asked me if I could make a cure, so I started playing "Mad Scientist", and came up with this cuticle cream, to help keep those cuticles HEALTHY! These fast and fun cakes are fat free, sugar free, and calorie free, and they hold secrets, too! Perfect table toppers and party favors for a Sweet 16 party, bridal shower, Mother's Day, or any festive event. Make single layer Tea Light covers (battery operated ONLY!) or double layer Treasure boxes~the secret? An empty toilet paper or paper towel tube! 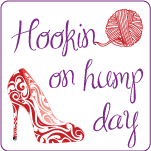 Red Heart Boutique Infinity Yarn~Review and FREE Pattern! The latest yarn I received from Red Heart was SCREAMING to become an Infinity Cowl! It is, of course, the Red Heart Boutique Infinity, and I designed my Infinite Wedges Cowl with it. Read on for my review of this yarn, and the free pattern, which only uses ONE skein!